The following events are scheduled to commemorate the fortieth anniversary of the deaths in Jonestown. Please feel free to revisit this page between now and November 18, 2018, as we expect other events may be added. In commemoration of the 40th anniversary of Jonestown, California Historical Society will present an evening public program on November 7th beginning at 6 p.m. about the complex ways Peoples Temple was interconnected and influenced by social, cultural, and political movements during its existence. Historians, thinkers, and survivors will come together to discuss how moments and movements of the 20th century, in California and beyond, effected and influenced Jim Jones, the Peoples Temple movement, and Jonestown. Speakers include Professor Russel Rickford, Professor Natalie Hopkinson, and Captain Yulanda Williams. It will be moderated by USF Professor James Lance Taylor. November 18, at 11:00 a.m.: Memorial Service organized by Dr. Jynona Norwood, Cherishing the Children Foundation at Evergreen Cemetery, 6450 Camden Street, Oakland, CA 94605. More information is at www.jones-town.org. 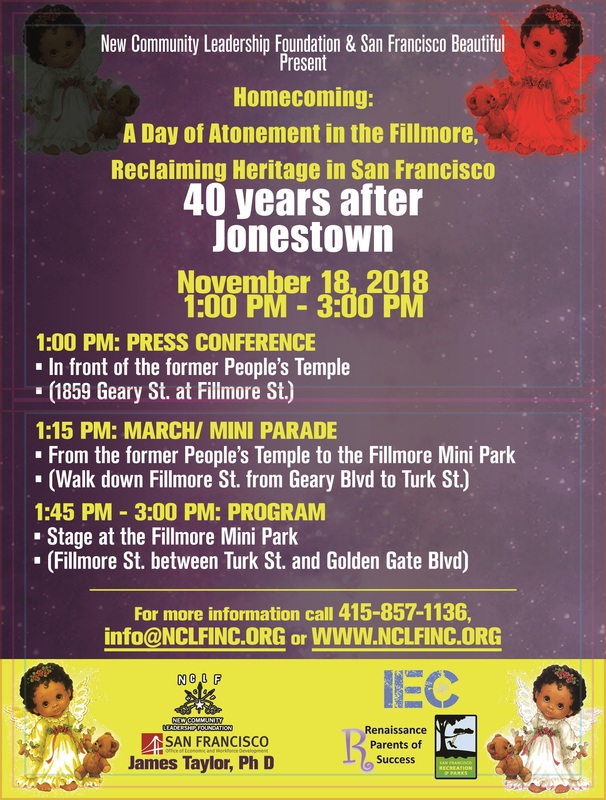 November 18, at 1:00 p.m.: March celebrating “Homecoming: A Day of Atonement in the Fillmore, Reclaiming Heritage in San Francisco,” from former Peoples Temple location at 1859 Geary Blvd. in Fillmore to Mini Park at Fillmore Street. A program of live music, food, prayer and the reclaiming and dedication of space in the Fillmore/Western Addition will begin at 2:30. Contact info@NCLFINC.org, www.NCLFINC.org or www.FillmoreMiniPark.com, or call 415-857-1136 for more information. Additional details are here. 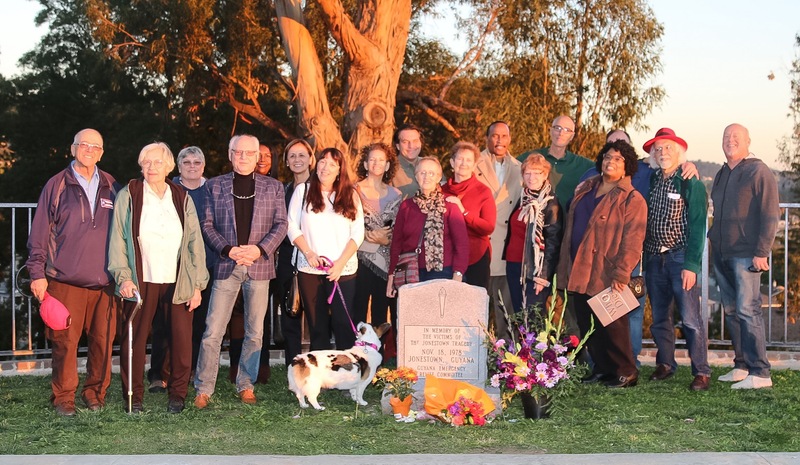 November 18, 3:00 p.m.: Memorial Service organized by the Jonestown Memorial Committee at Evergreen Cemetery, 6450 Camden Street, Oakland, CA 94605. In addition to scheduled speakers, there will be an “open mic” period in the program. Organizers of the event are asking people to limit remarks to two minutes due to the large number of people who wish to say something.There will also be a separate “open mic” period for children and grandchildren of survivors to speak, with the same two-minute limit. November 18, 5:00 p.m. (or whenever the service ends): A no-host dinner at Harry’s Hofbrau, 14900 E 14th Street, San Leandro, CA 94578. This is an informal event, with nothing planned except eating and visiting. November 18, 1:00 p.m.: Memorial Remembrance organized by Debra Van Neste, of the group Thinking Agenda, Lake Eola Park, 512 East Washington Street, Orlando, FL. November 19, 10:00 a.m. to 12:00 noon: Open House at the California Historical Society, 678 Mission Street, San Francisco, CA 94105. This is also an informal event, with the opportunity for former Temple members and relatives to view photos in the CHS collection and to visit with each other. Last modified on October 4th, 2018.